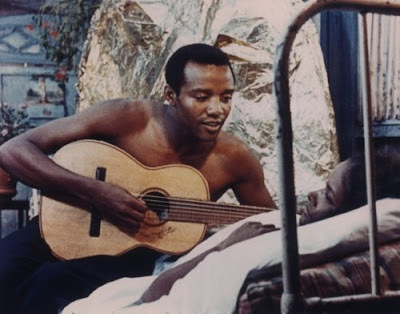 Black Orpheus provides a stark contrast to the seemingly endless entertainment diversions being dished up at multiplexes across the country, which allow viewers to remain passively numb for two hours. 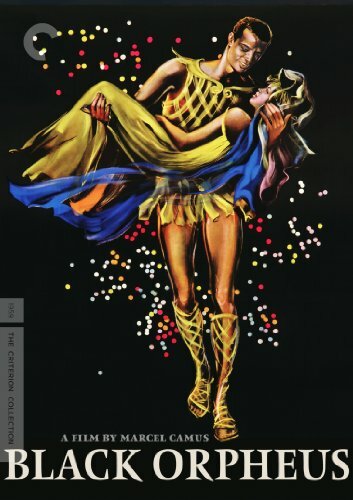 Simply put, to watch Black Orpheus is to be overwhelmed by the experience of it as you lose yourself in the sensuous rhythms and vibrant sights of Rio de Janeiro’s Carnival. Even fifty-one years later, the work generates a sheer cinematic contact high that infuses you with an invigorating jolt of adrenaline, making you want to dance along with the sea of authentic, amateur Brazilian performers turned debut actors in Marcel Camus’ breathtaking film. Structurally reminiscent of an opera given its slightly surreal style that punctuates some of the highs and lows it presents, the heightened nonetheless potent interpretation of the Greek myth of Orpheus immediately transports you to a distinct place and time. And although it foreshadows and delivers tragedy just as effectively as another summer 2010 Criterion Collection release – The Red Shoes – Black Orpheus replaces the more serious timbre of the Powell and Pressburger classic by imbuing their work with lush, intoxicating passion, and a true zest for living life to the fullest during each moment in time captured in the work. Famous for its usage of samba laced Bossa Nova which inspired Americans to embrace the musical craze with open arms in the early ‘60s given Orpheus’s influential soundtrack, the work which received an Oscar, BAFTA, and Golden Globe in 1960 as the Best Foreign Film of the previous calendar year first made an international splash by receiving the top prize at the Cannes Film Festival. Set during the course of a feverish Carnival weekend, Orpheus centers on a swoon-worthy trolley driver Orfeu (Breno Mello) whose gentle strums on the guitar can persuade the sun to rise. Shortly after becoming engaged the beautiful but tempestuous flirt Mira (Lourdes de Oliveira), Orfeu discovers his true love in the form of the newly arrived Euridice (Marpessa Dawn), who’s come to Rio to escape the personification of Death, portrayed by two-time Olympic Gold Medalist Adhemar da Silva. And despite the impending doom that pervades the two lovers swept away by the “madness” of Carnival in the sun-drenched community of impoverished yet proud residents, Orfeu and Euridice are unmistakably drawn to one another with an unstoppable force. Enhanced not just visually and sonically with a debris and grain free crystal clear film to digital restoration and transfer that rivals some recent Criterion efforts even in Blu-ray format, while the second disc of supplemental material is predictably excellent, enthusiasts of the film should be sure to peruse Michael Atkinson’s wonderfully rich accompanying essay as well. Similarly fascinating to revisit today to see the impact the work had on both foreign and domestic efforts that would follow – particularly in titles such as West Side Story which were themselves updates of classically revered literary material – Black Orpheus is also of notable importance for its forward thinking treatment of not only South American settings but also all black casts. With this in mind, it makes an interesting companion piece to Otto Preminger’s Carmen Jones starring Dorothy Dandridge and Harry Belafonte, which transported Georges Bizet’s Carmen to ‘50s black America. Avoiding pretentious techniques found in other subtitled efforts of the time that had the potential to alienate foreign film phobic viewers, Black Orpheus changed the face of both international and art films forever by using an upbeat approach to an eventually (and predictably) dour storyline. One of the highest performing foreign imports to arrive in American cinemas for decades, this bold work from director Marcel Camus continues to dazzle today thanks to Criterion's fantastic two disc set.